All of our clients are low income. Many are women and children. Some are victims of domestic violence who need help escaping violence and remaining violence-free. Others are disabled residents in need of housing assistance, some need help with appealing food stamp applications or applying for Medicaid, Medicare, or SSI. Our screening process is designed to prioritize clients whose problems are life-altering or threatening. Except under special programs, clients generally must be at or under 125% of the Federal Poverty Guidelines. This is measured based on your gross household monthly income versus your household size. How do I find out if I can get help from LSLA? Client applications are reviewed based on financial eligibility and other requirements. Clients who are unsure whether they qualify for our services can call the office at the phone number below. You can also call our toll-free number at (800) 733-8394. 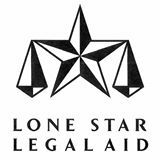 You may use either method to complete an application so Lone Star Legal Aid can determine if you are eligible for services. In some cases, like domestic violence, evictions or service of court papers, you may need immediate legal help. Please contact us right away. If our answering machine picks up, please let us know if it is safe to call you back or leave you a message. We will set up a time to talk when it's safe for you. All conversations are confidential. Emergency intakes will be accepted during business hours. Vietnamese Language Services are available. For other languages interpeters are available upon request.